How to get to KWANDWE PRIVATE GAME RESERVE, and a new activity while there? ACCESS — With scheduled charter flights, only 30 minutes from Port Elizabeth International Airport until you set foot on the reserve. Options also available from Plettenberg Bay and Cape Town. SPECIAL OFFER — free flights (from Port Elizabeth or Plettenberg Bay) for families and friends in villa stays. Save up to R 54 400 (approx. US$ 4 000). LAUNCHING — Winter Wilderness Walking, an experience that allows you to fully immerse yourself into the landscape and sleep under the stars. Up to 3 tents set up with raised beds and full linen, a private bathroom per tent, using bucket showers (with hot water) and eco-toilets. Port Elizabeth - Kwandwe: R 3 400 per person each way (approx. US$ 250). Plettenberg Bay - Kwandwe: from R 29 000 per flight (approx. US$ 2 120). Cape Town - Kwandwe: Charter rates on request. With over 54,000 acres of private reserve, the Kwandwe rangers are now sharing a shortened version of their 3-day solo training walk. This is one of the ultimate experiences for all rangers and the final test to their training. 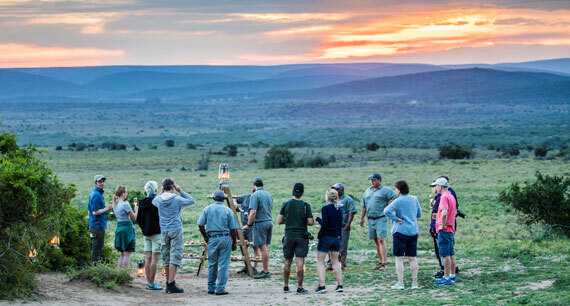 Guests will have the opportunity to experience all this freedom together with the assurance of an armed ranger, private camp set up and a vehicle escape if required. ACTIVITY RATE — R 9 000 per night (1 - 6 guests) supplement on per-night lodge/villa rate. THE EXPERIENCE — Depart from your lodge or villa, walk with your ranger and tracker to a private fly-camp for the evening. Here you sit around the fire, cook a meal over open flames, share stories and take in the sounds under the twinkling night sky. SLEEPING ARRANGEMENTS — up to 3 tents with twin/king beds, full linen, hot water bottles, and private bathrooms with bucket showers (hot water) and eco-toilets. VALID — between May and September (winter is the best as it is drier and cooler - perfect walking weather). CHILDREN — from 16 years are welcome. MINIMUM STAY — 3 nights at any Kwandwe villa/lodge. INCLUSIONS — private vehicle* and specialist ranger. *If guests decide not to sleep out, they can drive back to the lodge/villa after dinner. It's not often that you get a free flight or the opportunity to camp under the stars - in style. 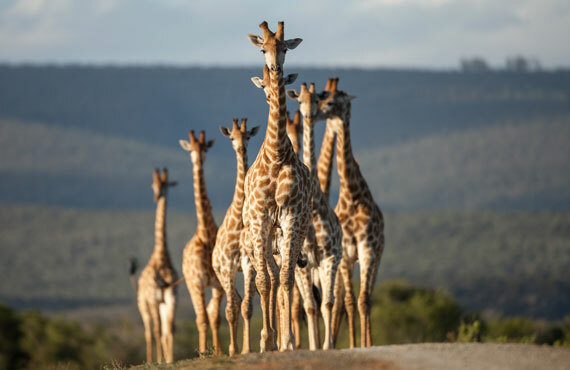 A visit with KWANDWE PRIVATE GAME RESERVE creates memories that last a lifetime.